Today I wanted to chat about summer sunglasses. With this heat and constant sun I think an essential piece to your summer wardrobe should definitely be an amazing pair or two (or three) of cute sunglasses. I'm not too big on spending a ton on sunnies. So many people misplace or break them that I don't think you need to make a huge investment into every pair. I'm a fan of Ray Bans and the one pair that I have, I purchased at full price a couple of summers ago. I also love Marc by Marc Jacob but the more I invest in sunglasses I have begun to think, these could be purchased at off price retailers like Last Call by Niemans, Off Saks 5th Avenue or for my AZ peeps - Last Chance by Nordstrom or Nordstrom Rack! Always do some research before you decided to blow $150 bucks and aim to find a good deal! 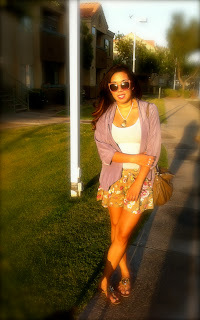 For wallet friendly sunnies I love Urban Outfitters, Forever 21 and Fossil. Here are the newest addition to my collection from Urban. They come in black too but I'm loving this sweet blush color. I think these may just become my favorite new pair! 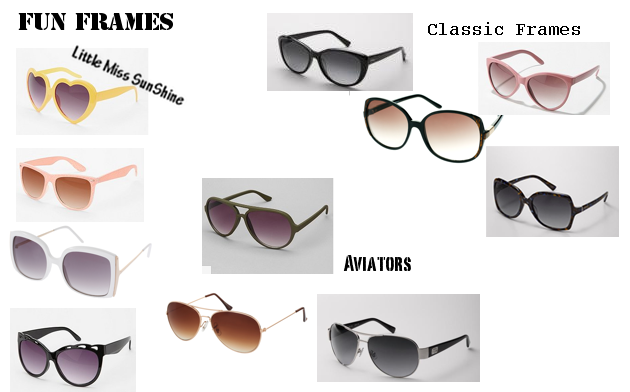 Here are some I found online featuring my three favorite frame styles; classic round, aviator and cute fun summer frames.